This morning at Avimor we had a pair of Killdeer scoping out nesting sites. Last year we had at least two Killdeer nests on the vacant commercial lots right along Avimor Drive. 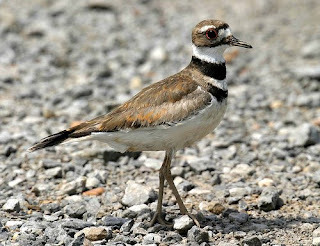 Killdeer are so called because of the sound they make, not some relation to deer or to killing deer. They are the most common and widespread member of the plover family of birds. 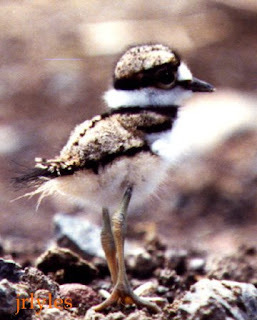 Killdeer make shallow nests right on the ground and therefore have to defend them from predators regularly. The most common defence method is to lure the predator away from the nest by faking a broken wing some distance way from the eggs. Some people get annoyed by the noise Killdeer make. I think they are cute, especially the young as they run around on the open fields. Wednesday afternoon, Stephanie, the manager of our design center and flooring company and regular birdwalk attendee, stopped by and noticed a hawk flying over the hills behind the model homes. I put my binoculars on it and it was a Red-Tailed Hawk with a snake clasped in its talons; an amazing sight to see. We had a pair of Mallards in the town lakes, which was a first for me to see. Doug says he sees them occassionally. I had seen Mallards and Wood Ducks in the creek last Spring. It'll be neat to see more waterfowl visit the ponds as some vegetation takes off. I watched a pair of American Kestrels chase off European Starlings in the cottonwoods near the Avimor entrance and I had a pair of Black-capped Chickadees callings along the creek. A large Common Raven was eating something on a vacant lot across from the sales office. 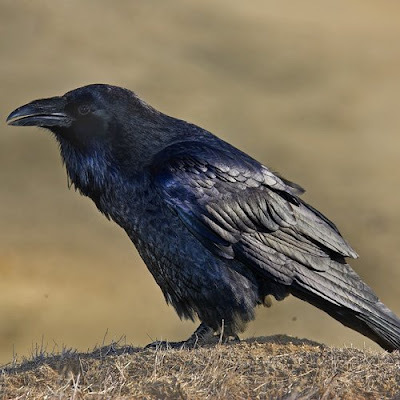 Sometimes it is hard to tell the difference between a Common Raven and an American Crow. 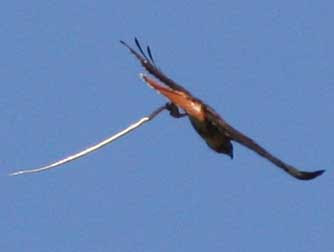 Overall size, beak size, and feathers along the neck are key indentifying traits. A windy snow storm the night before made the lovebird birdwalk a cold one for our 30 guests. Many of the usual birds were hunkered down or had moved down into the valley to avoid the weather. The birds were few and far between, but we had fun anyway! A warm beverage with sweet Valentine's cookies really hit the spot after that walk. Some new friends from "A Splash of Color Aviary" dropped by to display a couple pair of real life lovebirds and gave some cool facts about bird breeding. Michael Wiegand educated us on the various plants along the way. Robert tried out some "pishing" calls that seemed to get the attention of Ruby-crowned Kinglets and Song Sparrows. Special thanks to Kara Mortensen for the photos. A cute little cotton-tail bunny provided one moment of excitment along the trail. Now that Spring is around the corner we should start seeing some birds from the valley migrating back up the canyon toward the mountains as well as birds from the south migrating along the riparian areas. I just realized that our Lovebird Bird Walk will coincide perfectly with the Great Backyard Bird Count which occurs between Feb 13th and 16th! This means that whatever we identify and tally on our bird walk...I can submit it to the GBBC website. This info is used to help scientists track bird populations and migration patterns across the globe. There is also photo contest and other fun things related to the GBBC, so check out their website! Just as a side note - I submit all my public and private bird walk tallies to eBird. 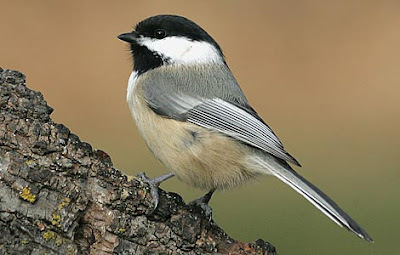 This site is a free service provided by the Cornell Lab of Ornithology, just as is the GBBC. It is a great tool to help you track your own bird sightings and life list of birds. It is extremely easy to use with a searchable database and maps of where birds have been seen. What a great research tool for citizen scientists! 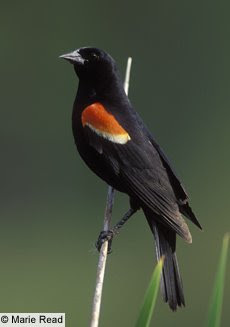 Driving into Avimor this morning I saw several male Red-winged Blackbirds. They are already staking out their territories awaiting the arrival of the ladies. During the winter some may migrate, but I know of some that flock together in specific locations and then spread out again in the Spring. My family and friends all know of my nerdy hobby of birding. One of the frequent questions I get is, "There is this black bird I keep seeing. What is it?" My father-in-law, who introduced me to birding, loves the refrain "A black bird is not just a blackbird." So here are few quick identification tips to help you figure out what that black bird is. Male Red-winged Blackbirds have that distinctive red shoulder patch with a yellow line. Their eyes are black too. There is no irridescence (color changes due to light reflecting off the feathers) on the Red-wings. Females don't look anything like the males. 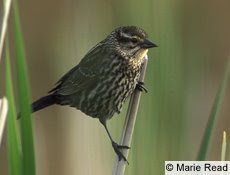 They look like a large streaky sparrow as shown in the picture below. Red-winged Blackbirds love water areas with lots of cattails and reeds. 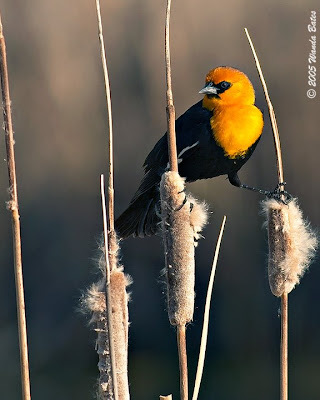 Yellow-headed Blackbirds also love riparian areas with reeds. Their yellow heads and distinct squawking make them easy to separate from the other black birds. 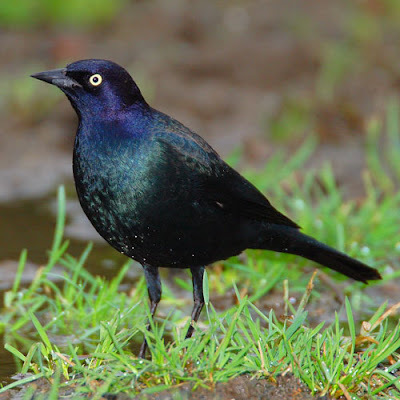 Brewer's Blackbirds are very irridescent with blue and green tones reflecting off their shiny black feathers. The main thing to look for in identifying them is that distinctive yellow-white eye. I often see them feeding along the edge of Highway 55 during the Spring and Summer. 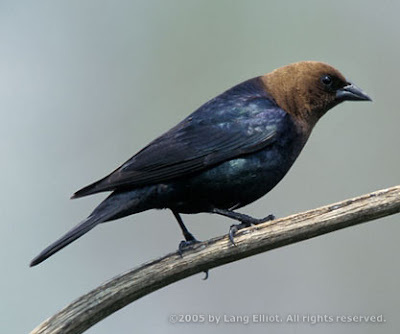 Brown-headed Cowbirds are easily confused with Brewer's because its black and shiny. The brown head isn't always a distinguishable as it is in the photo. But the key is to notice the dark eye as compared to the Brewer's.